More than a half century ago, a troubled mother, Rosalie Self [of the William Isaac Self line], put her two small sons in an orphanage home after the death of her husband; with the rest of the family unaware until after the fact. A few years later, the 2 boys were adopted by a family under the Tanner name. The Self Family began searching for the boys by using different known family names in their search. For 60 years, three generations have gone over clues of their existence. With the magic of internet and the best supportive website, Self Portraits: The Self Family NetLetter, the son of one adopted son, Harold Fontenot, and the granddaughter of Ed Self Family connected at one explosive moment when the two were looking at the same time for the same purpose. 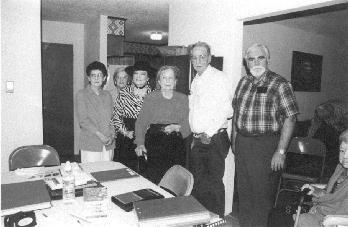 One week later, on August 4, 2001 the family met at the home of Mrs. Pauline Sparks in Kilgore, Texas. The only living Aunt, Lizzie Self Kuhn from Mt. Enterprise, Texas, was overjoyed to see both boys as she never thought that she would see them again. Other family members, Pauline Sparks and Norma Robertson of Kilgore, Velma Chaplin and Gertie Pepe of Shreveport, LA shared the joy at seeing cousins whom they had not seen in 60 years. Harold Jean Tanner and wife, Mady of Dawson, Texas, with his brother, James T. F. Tanner and his wife, Jane, from Denton, Texas were also as happy to meet their family as well as exchange information and pictures spanning those 60 years. Four generations of the Self Family were present to witness the reunion of 6 first cousins and the only living Aunt. We gratefully express our thanks to Self Portraits: The Self Family NetLetter for their help in connecting us together. There is a new joy in Texas! On July 12, 1857, at the home of William B. Self, there occurred a difficulty between John Cockrum and William N. Self. The latter died as a result of a wound made by John Cockrum with a Bowie knife. Many versions of this difficulty and the results thereof have been passed down from one generation to the next. Because my grandmother was married to John Cockrum's son before she was married to my grandfather, I had a driving determination to find what really happened on that day, and in the days and years that followed, concerning the matter. After the trial records were located and photocopied, it was decided that a transcription must be published in a genealogical periodical. Therein was much genealogical information and the only way to do a fair and nondiscriminatory story about those involved in this difficulty was to transcribe the trial records completely. On July 13, 1857, in Freestone County, Texas, John Cockrum was charged with the murder of his wife's brother, William N. Self. Below are excerpts taken from those aged records found in the courthouse in Freestone County, Texas. Testimony by Tilmon Self: " . . . Brother William said to Mr. Cockrum that he had told a God damned lie - from that Mr. Cockrum rose out of his chair & jerked a Bowie Knife from his side and stabed[sic] William N Self in three places and he died immediately. . . Mr. Cockrum was arrested by some person about ten or eleven oclock that night at my fathers.. . . "
Testimony of Mrs. Polly Self: " . . . Mr. Cockrum in the yard with a knife in his hand and my son, William, struggling in his blood. . . Cockrum replied, "If they will let me alone, I will let them alone.. . . "
" . . . Cockrum stuck the knife into William Self as he was in a rising position, his feet being entangled in the chair. . . Cockrum said, 'If they will let me alone, I will let them alone' . . . "
Further testimony of Mary Self: " . . . further testified . . . William threw his chair at Cockrum. I don't now whether the chair hit him on the head or shoulder . . . "
Testimony of Mrs. Patience Cockrum, wife of defendant: " . . . was present when William came in and when Cockrum came back he spoke to William Self but William did not speak to him. That Cockrum had been treated well by the family until William came down but that afterward the whole family treated him coldly. . . . William called Cockrum a God damned liar. That Cockrum then got up and witness' father struck him with a stick over the shoulder. After he got up William N. Self struck him with a chair and knocked him down again. That William Self also struck at him with a knife, left-handed, over the shoulder. . . That there was a barrel of whisky at the house and the men were all drunk.. . . "
Testimony of Franklin Taylor: " . . . had known John Cockrum about eight years and considered him a timid . . . not a violent or turbulent man.. . . examined John Cockrum's person another day after . . . small hurt and some clotted blood on his head. Also a small hurt on one arm and some blood on his shirt sleeve near the hurt." " . . . commit the said defendant to jail without bail and the Sheriff . . . reported . . . jail of Freestone County was not a safe . . . said defendant was ordered to the jail of Nacogdoches County." Sentencing: " . . . the said John Cockrum . . . feloniously, willfully and of his malice, aforethought and with deliberate design did kill and murder . . . assessing punishment of Solitary confinement in the penitentiary for life.. . ."
Exceptions: " . . . the defendant by his attorneys assigns the following errors of the court . . . " [9 errors were included. Number 5 seems to be the most important] " . . . 5th The court erred in instructing the jury . . . that they might on their discretion direct that the confinement be solitary . . . "
Supreme Court's Mandate to Freestone County: " . . . it is the opinion of this court . . . it is ordered adjudged and decreed that the judgment of the court below be reversed and the cause remanded for further proceedings . . "
Appeal from Freestone County: " . . . if they [the jury] believed the enormity of the offense required imprisonment for life, the were compelled to make it solitary confinement . . . "
Parts of Cockrum v. State have been cited in case after case, in several states - especially that portion as written by Oran M. Roberts when the Texas Appellate Court's decision stated, "The right of a citizen to bear arms, in the lawful defense of himself or the state, is absolute. He does not derive it from the state government, but directly from the sovereign convention of the people that framed the state government. It is one of the 'highpowers' delegated directly to the citizen, and is excepted out of the general powers of Government." The difficulty ended for John Cockrum when he died after having been incarcerated for only a few months. John Anderson Self, Jr., 83, passed away on Monday, June 10, 2002, in Hallmark Health Care Center, Summerville, SC, after an extended illness. Mr. Self was born October 10, 1918, in Plum Branch, SC the son of the late John Anderson Self, Sr., and Lizzie Mae Holson Self. He was predeceased by his wife of 30 years, Myrtle Avin Self. He was a resident of St. George, SC, and a realtor/broker in Charleston, sC, retiring in 1967. He was a Mason and Scottish Rite Shriner. Mr. Self is survived by one sister, Mary Kathryn Fooshe, McCormick, SC; five children: Kathryn Anne Fonseca (Chris), Martinez, CA, John Anderson Self (Sharon), Columbia, SC, James Lawrence Self (Priscilla), Summerville, SC, Donna Rae Mahrenholz (Scott), Virginia Beach, VA, Martha Delores Self (Leroy Lewis), Virginia Beach, VA; ten grandchildren: Donna Delores Falchetta, Concord, CA, Kelly Lynne Whitney, Pittsburg, CA, Angela Maria Self, Kerrville, TX, Jennifer Alice Self, Columbia, SC, Jamie Michelle S elf, Kristin Ann Hobby, Mark Miller, Jeff Miller, Tim Miller, and Mike Miller, all of Summerville, SC, Candice Lee Bell, Lillington, NC, Andrew Curtis Mahrenholz, Samantha Bartz, Ryan Bartz and Alexandra Self, all of Virginia Beach, VA; ten great grand-children, numerous nieces, nephews, and cousins. Services will be conducted at McCormick United Methodist Church on Saturday, June 15, 2002, at 11 a.m. by Reverend Don Clendaniel. Family visitation will be at the church from 10 to 11 a.m. prior to the service. Interment will be conducted afterward at Plum Branch Cemetery in Plum Branch. Memorial contributions may be made to the Endowment Fund, McCormick Methodist Church, P. O. Box 267, McCormick SC 29835. Funeral arrangements are being handled by Blyth Funeral Home. Note: The times were changed from 10 and 11 to 11 and 12 so people from out of town had an additional hour to get there. Marian Louise(nee Selph) Gregory, 87, of Richmond, VA passed away Thursday, April 4, 2002. She is survived by her loving husband, Robert E. Gregory; three sons, Robert W. Gregory, of Atlanta, GA; Richard W. Gregory, of Richmond; Wesley S. Gregory, of Richmond; one daughter, Shirley L. Sorenson, of Lake Monticello, VA; one sister, Shirley Selph Jennings of Richmond; nine grandchildren, 14 great-grand children; five nieces, four nephews; one Aunt, Louise Gregory. Her remains rest at the Bliley Funeral Home's Central Chapel, 3801 Augusta Ave., where the family will receive friends 2 -4 and 6-8 p.m. Saturday and where a funeral service will be help 2 p.m. Sunday. Interment will be 11 a.m. Monday, Oakwood Cemetery. Appeared in the April 5, 2002 Richmond Times Dispatch She was the daughter of Robert Samual Selph and Lillian Mae Gregory of Richmond, VA. Retired Master Sgt. Robert E. Self, age 67 of Fort Walton Beach, Florida passed away January 16, 2003. He was born in Vonore, TN and moved to Fort Walton Beach in 1967. Robert served in the U.S. Air Force from 1954 to 1976. He was preceded in death by his parents, Miles and Ruby Summey Self and his eldest brother, Marvin Self. Survivors include wife and soul mate, Margaret Self, daughter and her companion, Cheri Self and Tim Mathie, sons, Randy Self and his wife Sheila, Neal Self and his wife Kim, grandchildren, Seann Self, Bobby Self, Brittanie Mathie, Chris Mathie, and Michael Mathie, sister, Gena Cooper, brother, Mike Self, niece, Rita Workman and husband Don Workman and their children Josh and Kevin. In July, 2003, Robert and Margaret would have celebrated their 50th wedding anniversary. Robert was a loving husband, father, grandpa and friend. He will truly be missed by his loved ones, but he has left them with many special moments to remember. A memorial service will be held at Heritage Gardens Funeral Home in Niceville, FL on Monday, January 20, 2003 to celebrate the life of this special person. "...his wife was the daughter of Peter Self, granddaughter of Peter Self and there might have been a great grandfather named Peter Self but not sure. All of these people are buried in the Ellis Cemetery in Benton County Tennessee on Ellis Ridge. Jepsy was part Cherokee and was over 6'0" tall, handsome, black hair, dark skin, operated a store on Ellis Ridge. Jepsy and wife were better known as Bet and Bose." Note: Mary Elizabeth (Selph) Ellis had a line back to Olde Robert Selfe as follows: Peter Selph, Peter Smith Self, Moses Self, James Self, John Self, Olde Robert Selfe. "Jepsy and Mary Self-Ellis had a daughter, Mattie Ellis. Mattie had the black hair and pretty white teeth of her father. Mattie married John "Monk" Noles but they had no children. So Jepsy (Bose) and Mary (Bet) their family line ran out when Mattie died. The grandparents of Jepsy were William Wyly Ellis, II and wife Nancy Riley and she was full blooded Cherokee. This Ellis family came to Benton County TN about 1836." "Mattie was beautiful no joke. She wore her black hair with a bun on top of head. After the death of William Wyly Ellis, II he left his wife Nancy Riley plenty and at her death Theney was to inherit it. Hovever, Theney died before her mother so when Nancy died Ellis Ridge was partly owned by Jepsy (Bose) Ellis and wife Mary (Bet) Self. After the death of Bose and Bet Mattie inherited. However, that part of Ellis Ridge was not taken out of the name of William Wyly Ellis, II from time he bought it until Mattie sold it in about the early 1970's. And when Mattie sold out she had contract to still live there until her death. Also in the sale Mattie excluded the Ellis Cemetery in that sale. Seems to me there are 3 men in the Ellis Cemetery named Peter Self with home made bread pan markers made by Mattie's loving hands. Also a way a man paid his taxes in Benton County Tennessee was in part to labor building roads where they lived. So as history has it, William Wyly Ellis, II, John Nordin, and one of the men named Peter Self, all neighbors, helped to biuld the Old Union Church Road near Holliday, TN. Also, there was 3 or 4 men named Peter Self as one Peter Self married Rachael Ellis, second cousin to Bose. I think this is all I can remember about the Peter Self family but William Wyly Ellis, II must have thoughts lots of the Self family because they are buried in our Ellis family Cemetery." "Peter Self and wife Rachael Ellis had at least 2 sons, Charlie and Early. Seems this Peter Self must have died young as Rachael remarried to a Henry Webb and they had a daughter, Georgia Webb named so after Rachaels father, George Ellis. Maybe not so fun to Rachael but fun in our times, seems Peter Self was so jealous hearted of Rachael that he is said to have disked around and around the house every morning before he went to work each day and then searched it for foot prints when he came home." "William Wyly Ellis, III and wife Dolly King is my family line and they knew the men named Peter Self. One story handed down in the Ellis family was about Charlie Self and my grandmother Nancy(Madame) Baker-Ellis. Seems she weighed just under 100 pounds and they say Charlie was a big huge guy. Well it seems Charlie for amusement would take on and fight several other men at same time for the fun of it, not being mad, just for the sport of it. And it is told Charlie could whip the best men around. Anyway one day Charlie offered to whip my uncle Lester Ellis as he was just a baby big enough to walk, run and play. So my grandmother whom was churning at the time pulled the dasher out of her churn with the stone top still on the dasher and worped big Charlie once and brought him down on his knees. The Madame went back to churning. The family still laughs today over 80 years ago when the Madame did this about how tough Charlie was but 90 pound Nancy Baker brought him to his knees as the chant has it." Tom Self, Sr., pioneer retired Choctaw county farmer and ranchman, died at his home this afternoon at 3:35 p.m., after an illness of one week. Thomas Sloan Self, 73, a pioneer of this section of Oklahoma, passed away November 20, at the home of his son, Thomas Self, Hugo. Mr. Self was recognized as an outstanding citizen of this section of Oklahoma and particularly of Choctaw county, were he was well known. Mr. Self was born in Fannin County, Texas, near Honey Grove, Texas, in 1868 and came to Indian Territory when he was about 14 years of age. He moved here with his parents. Later he married Miss Annie Usery, a daughter of James Usery, a citizen of the Choctaw Nation who had become prominent by virtue of his interest in Choctaw politics and held the office of County Judge under Choctaw Tribal Jurisdiction. He is survived by his wife, Annie Self and six sons, W. P. Self, Hugo; H. E. Self, Shafter, Calif., J. E. Self, W. O. Self, T. R. Self, and R. R. Self , all of Hugo , and by two brothers: Doss Self, Foreman, Ark., and Chas E. Self, Cloudy, Oklahoma. He was a member of the Baptist church for a number of years and was consistent with the Christian tenets of that church. Funeral services will be held at the First Baptist church, Hugo, on November 22, at 2 o'clock p.m. and interment will be held at Roebuck Cemetery, Southwest of Hugo. Snow Funeral Home is in charge of all arrangements. Tom Self will not be buried in the Roebuck Cemetery until the roads may be more easily traveled. Funeral services were held Saturday afternoon at the First Baptist church. NOTE FROM COUSIN JOLYNN: This is my husband's great grandfather. The first one has mistakes but the second one is correct. Doss Self of Ervin was in the city for a few hours yesterday and stated that he had been confined to his room for the past three days with a cold. Boswell Lady Badly Hurt by Frisco Train Sunday. A Faisco (sp) Train run over and badly injured Mrs. Self at Boswell last Sunday. She and her husband resided near the track and as she attempted to cross the track was struck by the train. G. W. Self and wife to John A. King lot 4 in block 53 Boswell, $100. James Usray [father of Annie Maud Usray Self who is the wife of Thomas Sloan Self] to G. W. Dodd 166 acres of section 33 township 7 south range 18 east, $500.